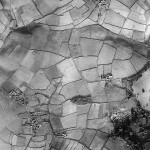 After World War II, RAF photo-reconnaissance units were detailed to take vertical aerial photos of the entire country. 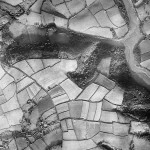 This created an extremely important source of information, not least for the planners required to implement the 1947 Town and Country Planning Act. 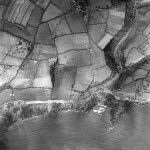 Wembury’s coverage was flown by 58 Squadron on December the 10th, 1946, during two passes of the aircraft – one east-west and the other west-east. 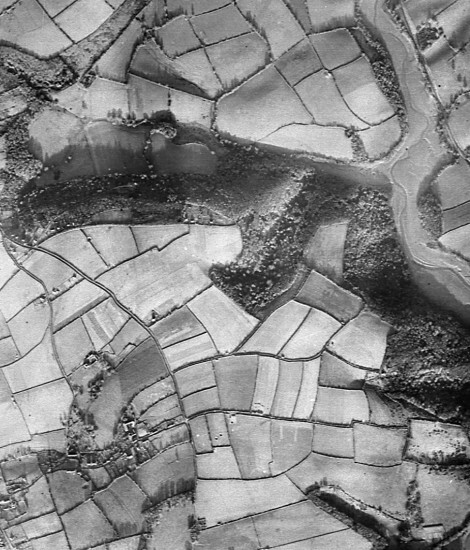 The first 6 pictures in this set cover the south of the parish, starting at the river Yealm and continuing to Bovisand and Staddon. The final 5 cover the north, commencing at Staddon and ending once more at the Yealm. 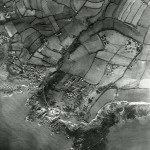 By 1946 the rough cliff land along the coast, and extending into the Yealm estuary, had been owned by the National Trust since 1938. Just north of the cliffs, the buildings of New Barton farm can be seen one field inland. 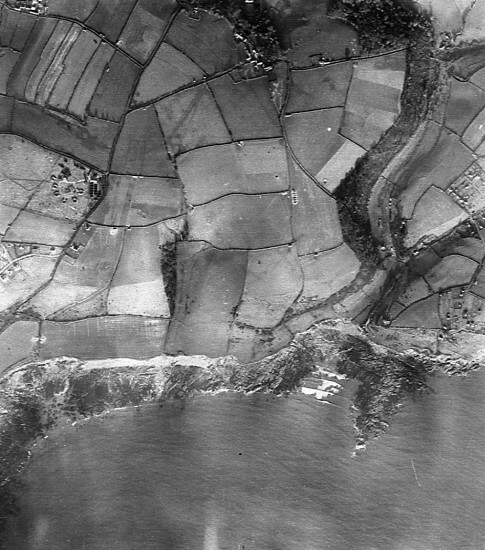 The edge of pre-war Wembury is in the north west corner, and Wembury House is a few fields to the east. White breaking waves mark Wembury beach. To the east, the dark triangle protruding into the sea is Blackstone Reef, immediately below St Werburgh's Church. The line of development heading north east from the beach is Church Road, with its straggle of ribbon development. On the cliffs just east of Blackstone Reef a cluster of sheds and old buses overlooks the cliff. Today this site is Cliff Road. 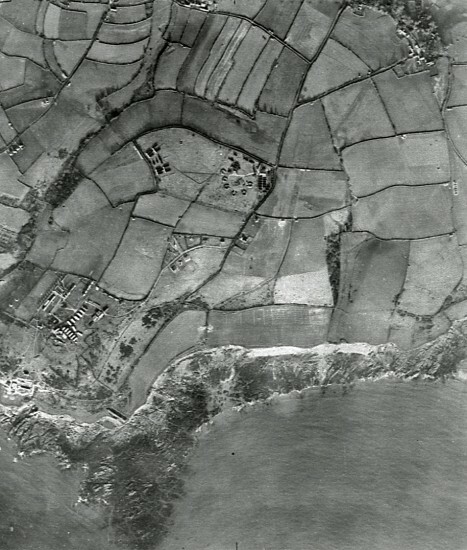 Church Road and Wembury beach occupy the east of the photo. 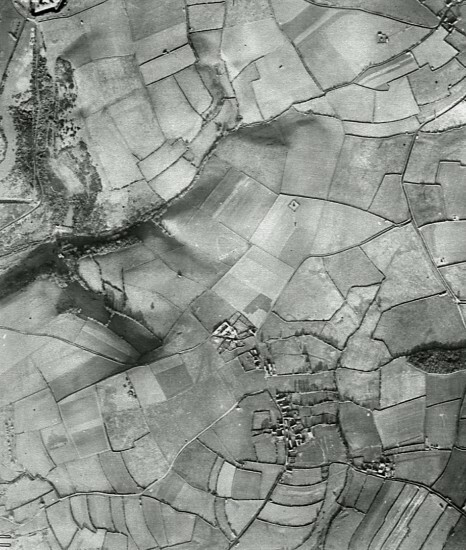 In the north west the surviving evidence of open strip fields is clear. 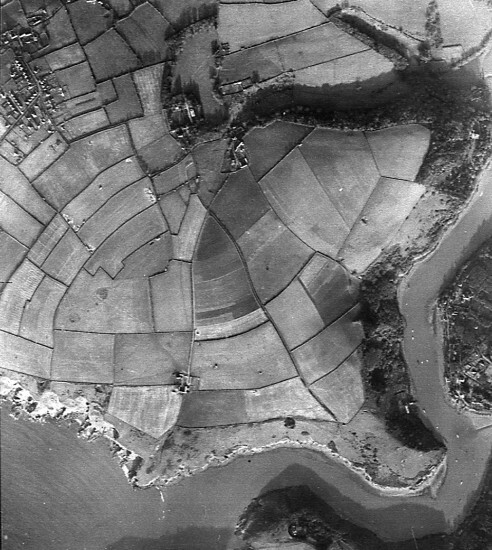 South of the ancient strips, a semi-circular feature is a major anti-aircraft battery, with ammunition stores, etc nearby. This was an important part of Plymouth's WWII defences. Wembury Point dominates the south west of the photo. Numerous war-related buildings on the Point were the precursors of the post-war naval gunnery school, HMS Cambridge. 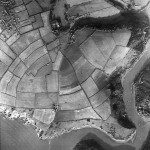 The semi-circular feature to the north is a major anti-aircraft battery. 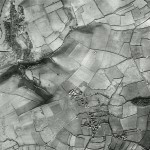 In the farm landscape, the outlines of medieval strip fields survive, and part of Langdon is visible in the north east. Another view of Wembury Point, its legacy of wartime military installations, the semi-circular anti-aircraft battery further north and echoes of open strip fields. 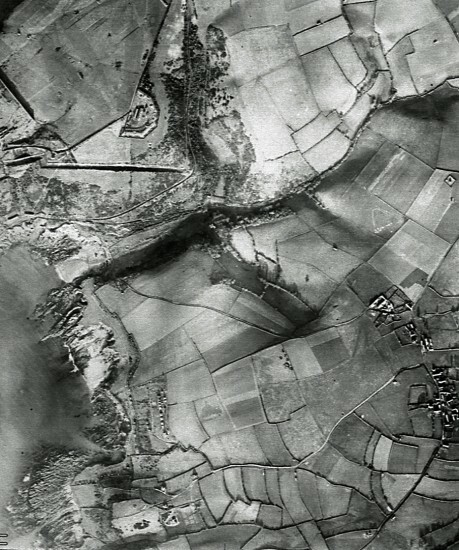 What is additional is the new 1930s settlement of Heybrook Bay immediately west of the Point. New housing here was planned to spread over the whole Point, but was prevented by the war. 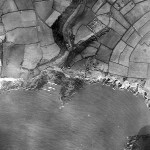 The coast north of Wembury Point. 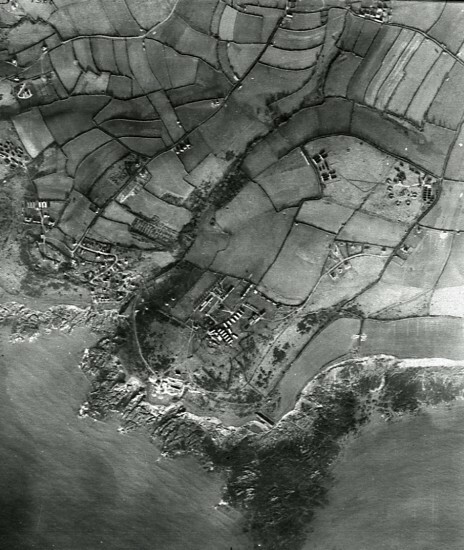 Bovisand Bay lies in the north west, flanked on the north by part of the impressive late-19th century Staddon Heights defences. The settlement in the south east is the village of Down Thomas. 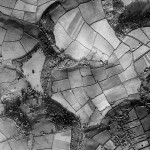 The village running roughly north-south is Down Thomas, with nearby Gabber Farm in the south east corner. 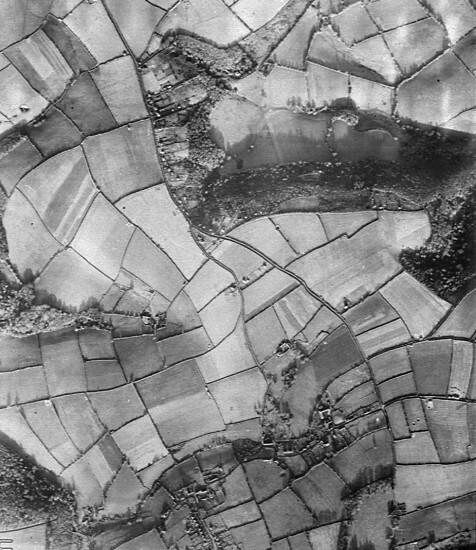 The ancient pattern of strip fields is once more very evident in the south. 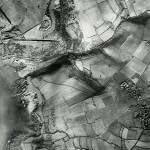 The deep valley in the north west is that leading down to Bovisand beach. Bovisand Lodge appears as a cluster of buildings in this valley. Down Thomas occupies the south west corner. Langdon Court can be seen in the south east, surrounded by woodland. 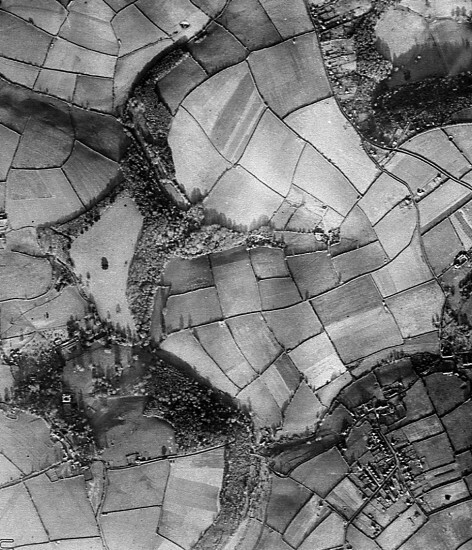 Raneleigh Farm is to the north and slightly west of Langdon, while Stadiscombe is just visible on the northern edge. 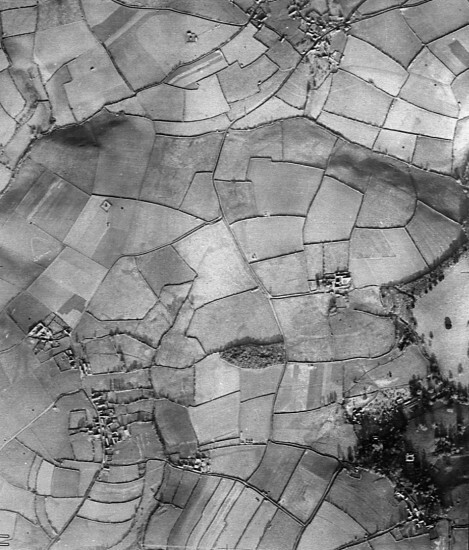 Langdon Court is clearly visible as a white square in the south west. Its landscape garden lies immediately east, leading down to woodland in the valley. 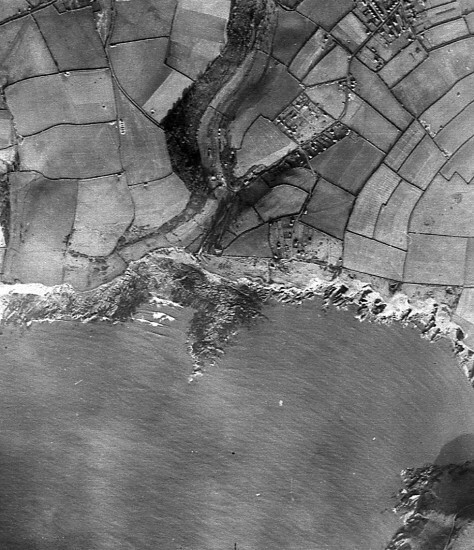 1930s Wembury dominates the south east. The right angle visible on the road passing through the buildings is the sharp bend at the top of Church Road. Most of the buildings here are houses built on land sold off after the break-up of the Langdon Estate in 1927 - typical inter-war ribbon development. Knighton runs roughly east-west in the south. Half way along Knighton, Traine Road heads north, while Wembury Road curves off to the north from the eastern end of Knighton. 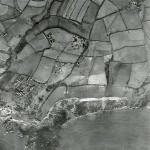 North of the junction of Traine Road and Wembury Road, 1930s Hollacombe is visible as a straggle of buildings. The large wood is Hollacombe Brake. The eastern end of Knighton can be seen in the south west. Traine Road and Wembury Road curve northwards and slightly westwards from Knighton to converge at Hollacombe. Traine Farm can be seen between these two roads. Hollacombe Brake, the wood running east-west, leads into Wembury Wood on the edge of the sinuous Yealm Estuary. 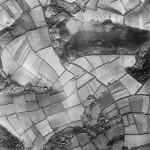 It is low tide - the river is a trickle winding through the mudflats.